Sold separately, along with the Original V-Pet's was the Digimon License. 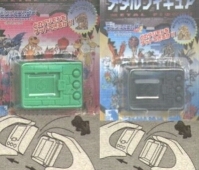 Also called the Digimon Dog Tag, they contained the D-1 Grand Prix Icon and the statement "Digital Monster Tamer" and then your own Serial Number. They helped identify people who owned Digimon and made things a little more personal. It is a nice little piece of Digimon Memorabilia to show off. These cages are invaluable to those with the Original V-Pet and Pendulums. Your toy sets right into the cage and the lid closes while the chain dangles out a small hole that you clip to your belt loop. It protects your Digimon from crashing around and anything damaging the LCD screen. The most novel thing about these cages is that there is a slot on the right side of the cage where you can still press the buttons and use the toy without opening the cage. These toys come in two styles, Agumon and Patamon, with two options. The first is a sound responsive function where any loud noise will make the Digimon talk (either its name or its attack). The second function is the battle option where you connect your Original V-Pet or Pendulum to the base of the toy. These toys will usually defeat an Original V-Pet, and will usually lose to a Pendulum. These little mini v-pet shaped toys are very small. They measure less than an inch in height and only about an inch wide. They open up like a jewelry box and inside is a small metal figure (about the half the size of a marble). The metal figures are in the shape of the Digimon from the respective pet.